"I remember once at St. James Park, Newcastle, Malcolm Macdonald had scored a hat-trick against us. He was making his home debut, I'd missed a penalty and Kevin Keegan had given one away. 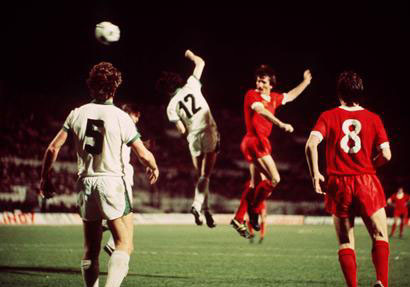 Towards the end of the game Macdonald went up for a high ball with Ray Clemence and Clem clattered him. He had to be carried off and as he lay on the stretcher I walked over to him and said 'Right, that's yer lot, you'll never score another f*****g goal against Liverpool while I'm on the same pitch', and I meant it, and what's more, he never did. At the end of that season we played them in the Cup Final and once again words were exchanged in the tunnel before the game. Then we went out and slaughtered them 3:0 and it could have been 6." 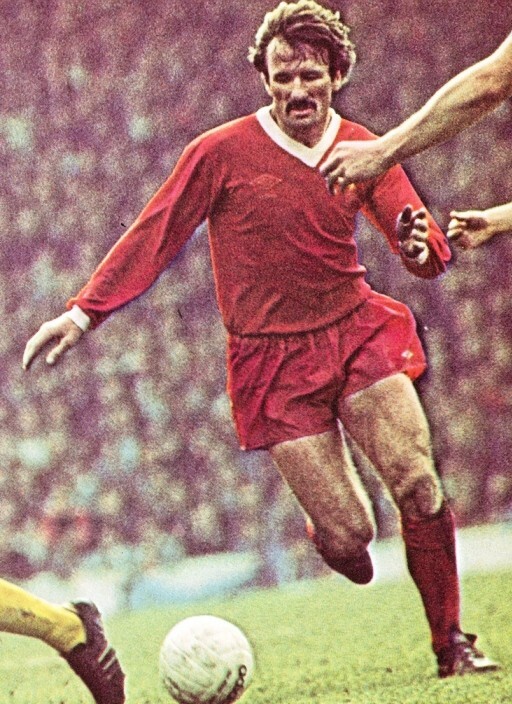 Of course the reputation Tommy Smith forged for himself as a hard man, the 'Anfield Iron', belies the huge amount of ability and skill he had. Playing 638 games for Liverpool is testament to that. Often overlooked too, is the fact that Tom was a member of the England team that won the Junior World Cup in 1963, playing alongside illustrious names such as Ron 'Chopper' Harris, Len Badger, Jon Sammels, John Sissons and Lew Chatterly. The simple truth of the matter though is that Tommy was a hard man who played to his strengths. "I make no bones about it, that's what I was good at. Some players were good dribblers, others good headers, I was a hard tackler and I used it to gain that 'edge' that Shanks was always looking for." The hard man tag was sometimes a hard one to shake off as Tom recalls. "There was an incident once when I was coming back from injury and had played for the reserves in a match against Preston at Anfield. I was approached by a chap and his wife as I left the ground. I asked if I could help them and they simply thanked me for not kicking their son. He had been playing inside left for Preston ! Again, it showed the value of reputation. I'd had absolutely no intentions of doing anything to this kid but my reputation had obviously not only got to him but to his parents as well." Liverpool's triumph that day in May 1974 was total. Macdonald had publicly pronounced what he was going to do to Liverpool via the national press and Smithy and co. answered in the best possible way, never giving Macdonald so much as a sniff at goal. The Liverpool defence had regained the edge. Sadly it was to be Shanks' last competitive match at the helm as he announced his retirement in the summer of that year. Many people, Tommy Smith included, thought the short sightedness of the board in refusing to grant Shankly a place on the board was spiteful. "Shanks was wrong to keep turning up at Melwood, giving advice and acting as if he was still in charge. There's no doubt about that, but the club directors were wrong the way they treated him. They got their own back, it's as simple as that. Shanks had always been difficult and he would have created one or two problems for them. The directors settled some old scores in 1974." Tommy of course, settled a few old scores himself out on the pitch. He played in an era when the game's legendary hard men proliferated. As well as his England Junior team mate Ron Harris at Chelsea, there was Billy Bremner and Norman 'Bite yer legs', Hunter at Leeds, Dave MacKay at Spurs and Derby, and Nobby Stiles at arch rivals Manchester United. Tommy has great respect for hard men of yesteryear and keeps in touch with his old sparring partners. "Norman, Nobby and I are great mates nowadays," he explains. "They both won 28 full England caps to my one, but I ask them jokingly how many club honours they won and their honours pale into insignificance to mine." "The decline is the result of lots of things that have happened. I get annoyed when people blame Kenny Dalglish. I was around at the time he resigned and I could tell the guy was heading for a nervous breakdown, he was under too much strain. Graeme Souness ruled his own way when he replaced Kenny and I think he made a fool of Liverpool F.C. with some of his signings. He gave other clubs what they'd always been looking for, a chink in Liverpool's armour. Then we had Roy Evans who wasn't the best manager in the world but far from being the worst, but we've never been able to make up lost ground. I look at the players at the club today and the basics don't seem to be there a lot of the time. Just simple things like how to line up at free kicks, or even how to take throw ins". Tommy sees the decline of Liverpool's fortunes part of a greater malaise afflicting the game in general in this country. "Sadly, football in England has declined since we won the World Cup in 1966. Suddenly we had coaches appearing out of drainpipes and we've got players now who are nowhere near as good as players were in the 1960s and 70s. They're possibly fitter, but that's all. Remember, in my day, we played on heavy pitches with a ball that weighed a ton, nowadays they play on bowling greens with a balloon. The pitches are faster, the ball's quicker but the players aren't any quicker than we were. You can't tell me there are better players around now than Bestie, Greavsie, Roger Hunt, Bobby Charlton, Bobby Moore and so on. I reckon there are only two or three England players today who would be able to cope if they played back in the 60s." Dateline: May 25th 1977, Olympic Stadium, Rome. "We had been working on a move where Steve Heighway would float a ball to the near post and I would flick it on to Kevin Keegan, but on this occasion, Stevie drove the ball in. I just went for goal. Listening to the BBC commentary, you'd think every other player in the team had scored except me." Lesson number two: Never leave Tommy Smith unmarked at the near post and think you can get away with it. "I was only fifteen and playing in a five-a-side game at Melwood. I nutmegged Byrne and scored and I was on top of the world. A couple of minutes later a ball dropped between us, I went to head it and Gerry headed me and I went down with a gashed eye. As I lay on the ground covered in blood, Shankly strolled across, looked down at me and said 'Lesson number one, never nutmeg Gerry Byrne, son and think you can get away with it.'"